Works to install telemetry equipment in a number of the reservoirs feeding the Crinan Canal will get underway in Spring 2019. 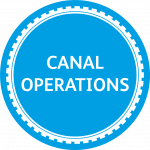 The canal is fed through a series of remote reservoirs which we monitor to check water levels and manage our water resources in times of drought or heavy flooding. Works to install telemetry equipment in six of our reservoirs, as well as the two canal basins at Ardrishiag and Crinan, will get underway in Spring 2019 allowing us to remotely monitor these water levels more efficiently. We will also be replacing gaugeboards in five of the reservoirs as well as making improvements to the existing telemetry stations along the canal.